You are here: Home / 2014 Tennis Season / Win a Wilson ProStaff RF 97 Autograph! Win a Wilson ProStaff RF 97 Autograph! First my sincerest apologies for not updating TennisThis.com as much lately. Unfortunately, life has been getting in the way of keeping up with the Joneses. Gotta keep those bills and family taken care of. Anyway, I’m inching my way back into the tennis blogging world and starting it with a bang! Like almost every major tournament, I like to give stuff away so with the US Open just weeks away, I’m going to be giving away something really cool! Also known as Roger Federer’s tennis racquet of choice. We’ve waited for over a year to find out what the blacked out weapon he carried in his bag was; now that it’s finally here, I’m giving one away! Woohoo!!! To be clear, a Wilson ProStaff RF 97 Autograph is up for grabs, none of the other versions of the new ProStaff line will be available. How excited are you at the opportunity to win a Wilson ProStaff RF 97 Autograph??? I would be totally stoked that’s for sure. It’s really too bad I can’t enter my own giveaway. 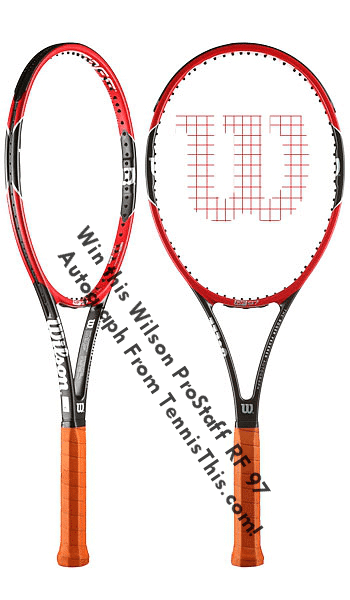 All kidding aside, this is a great opportunity for you to win this sweet Wilson ProStaff RF 97 Autograph and be the first on the courts with it. How do I enter to win a Wilson ProStaff RF 97 Autograph? Well, it’s super simple. Like every other contest I’ve done in the past, I have certain requirements; simply enter a comment in the comments section, share on twitter/facebook/instagram/reddit/wherever and wait patiently while the US Open starts and finishes. A single winner will be selected at random at the end of the 2014 Men’s US Open finaland that selected winner will be contacted by me. At that point, the winner has 24 hours to respond to my email confirming they are willing to accept this awesome prize. Also,since the Wilson ProStaff RF 97 Autograph will not be shipping until October 1, 2014; the winner will have to be patient and wait until the racquets are shipped! 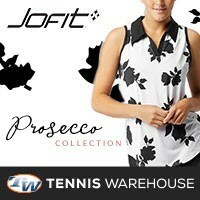 This time, I’m going to ask for comments to tell me what’s in your tennis bag! Make a short, or long, list of what’s in your bag (racquets, strings, wristbands, dampeners, etc?). Oh and of course, I would love it if you shared on your social networks too…the more entrants the more fun! This is all the very very important stuff to know for entering this contest to win a Wilson ProStaff RF 97 Autograph…. Giveaway applies to all countries in the world (unless if you live a country with no internet). If an international winner is selected, winner is responsible for all shipping costs and any addition VAT or fees for shipping. My tennis bag is actually a blue IKEA bag. Heres to a Federer Djokovic US Open Final with Fed in 5 sets! – 2 Pro Staff 90 six.one BLX2 (361g) stringed with rip control. – 4*2 Head ATP Ball. – A cookie box with almond bar and cereal bar. – 2*1.5 litres of vittel. – 47.30 euro to buy a drink if i win a match in a tournament. – The magic box : 9 grips, hand injury bandage, 5 ibration isolator, scissor. Babolat & Wilson dampeners and..
1 Eco energy water bottle for carrying water. 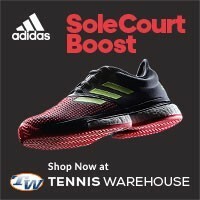 Really REALLY want my hands on that new racket, sounds right in my spec range! The ProStaff RF 97 looks very intriguing! Javier! This giveaway is amazing! Just shared on my Twitter. Cool giveaway, good luck to everyone! My bag is so big, that it has WHEELS! Looking forward to see if they new RF97 really feels like the 90. 4-5 Bottles of various liquids such has coconut water, Gatorade, or just plain water. Wow! What a great competition! Energy drinks + energy bar! Here’s what’s in my bag! – 3 DIFFERENT rackets. Not sure why. – Overgrips. Always a bunch. – Towels. Fresh clothes. Shampoo. A pair of socks. 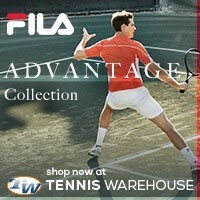 – 3 bags to store shoes, used clothes, and old tennis balls for practice. Thanks for the opportunity, this is actually really cool! Two water bottles, athletic tape, and a borrowed Prince O3 Red racquet. What’s in my tennis bag? What a great competition! Will share for sure. 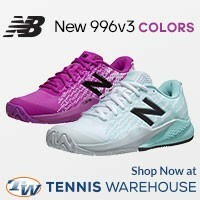 Really want my hands on that #RF97. Three Blade 93s (Darth Vader paint job) strung with Volkl Cyclone. One ProKennex Redondo 98 (RPM Blast on this one). Sports beverage (mixed at home). A pack of Tourna lead tape. A small bag of dampeners. A bag to store sweaty clothes. 2 unopened cans of tennis balls (Wilson US Open). A bottle of vodka (not really).